Massaging the sore muscles and painful joints with Arthcare Oil helps in providing fast relief from pain and swelling. The oil helps in cooling and soothing the painful areas and the anti-inflammatory ingredients work directly on the swollen tissues. With regular application, Arthcare Oil helps in reducing the frequency and severity of arthritis flare-ups. Arthcare Plus capsules contain a variety of herbs with active anti-inflammatory compounds. They help in blocking pro-inflammatory enzymes, thereby helping in decreasing pain and inflammation of the muscles and joints. The dietary supplement helps in maintaining joint and muscle functions. 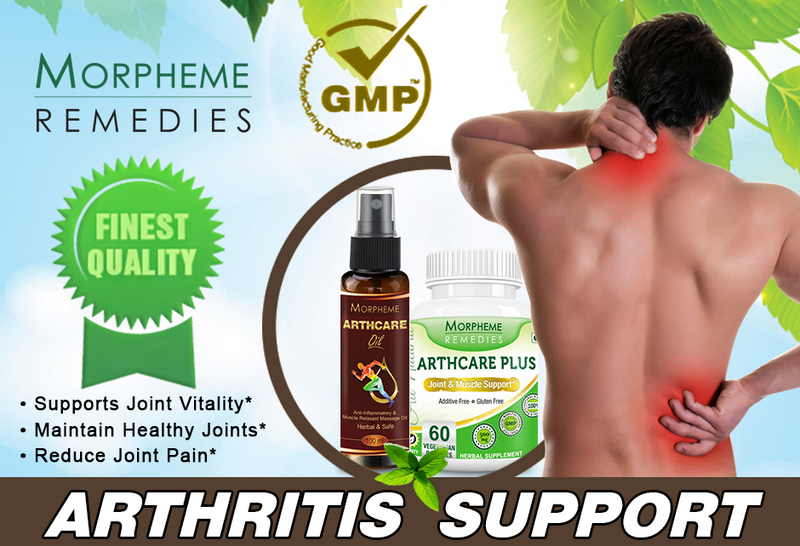 Arthcare capsules and oil both are of great use for treating arthritis and swelling problem which are mostly occurred in old age people. These items works perfect, I am purchasing this combo pack again. Ingredients In Arthcare Oil: In Morpheme Arthcare oil, Each 10ml. contains: Camphor (Cinnamomum camphora) 500 mg, Peppermint (Mentha piperita) 500 mg, Shuddha Guggulu (Commiphora mukul) 100 mg, Garlic (Allium sativum) 60 mg, Gandhaprasarini (Paederia foetida) 60 mg, Ajwain (Trachyspermum ammi) 60 mg, Nirgundi (Vitex negundo) 60 mg, Erand (Ricinus communis) 60 mg, Rasna (Pluchea lanceolata) 60 mg, Ashwagandha (Withania somnifera) 50 mg, Kadamb (Anthocephalus indicus) 30 mg, Padmakh (Prunus cerasoides) 30 mg, Devdaru (Cedrus deodara) 30 mg, Shuddha Kuchla (Strychnos nux-vomica) 20 mg, Krishna Marich (Piper nigrum) 20 mg, Oil base (Til Oil) Q.S.